Grooming is a big part of owning a Newfoundland and the adventure starts the day that you bring your puppy home but many people overlook the importance of introducing grooming at an early age because they are more concerned about basic dog training than basic grooming. It seems like owners expect their puppy to like being groomed as if it’s genetic. The puppy should understand what a brush or comb is and that they have to like it because they’re a Newfie and that’s what Newfie’s do. Just like a puppy needs to be trained on how to potty outside, they need to be trained to be groomed. They need to learn to stand on a grooming table and not bite the brush. It’s the owner’s responsibility to teach this and it’s a commitment that every Newfoundland dog owner makes when they bring their puppy home. 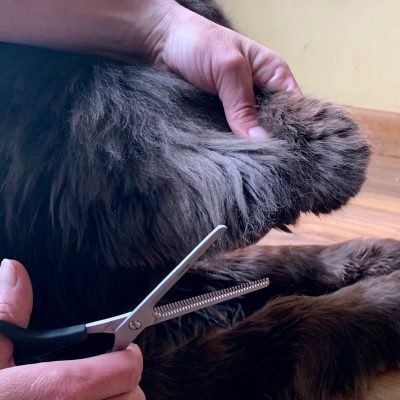 Even if you plan to take your Newf to a professional dog groomer, they still need to be trained to be groomed and the earlier you start this process, the easier that it’s going to be on all of the people involved in that dog’s life. Even a few months can make a huge difference. With Sherman, we didn’t really start to get serious about grooming until he was around 9 months. I used to groom him on the floor whenever I had time. He was fine and never really had any issues until we tried putting him on a grooming table. That was a mess and it took us several months to get him comfortable with it. Leroy was on the grooming table the day that he came home and the only issue that I had with him was that if I tried to brush him on the floor and not on the table, he would try to eat the brush. Grooming should start the day that you bring your Newfoundland puppy home. Hopefully, the breeder that you purchased your Newfie from has already introduced grooming and it’s your responsibility to continue the process. Bring out the brush immediately and get your puppy used to being brushed and touched. Set aside a few minutes each day to brush even if it’s just puppy fluff. 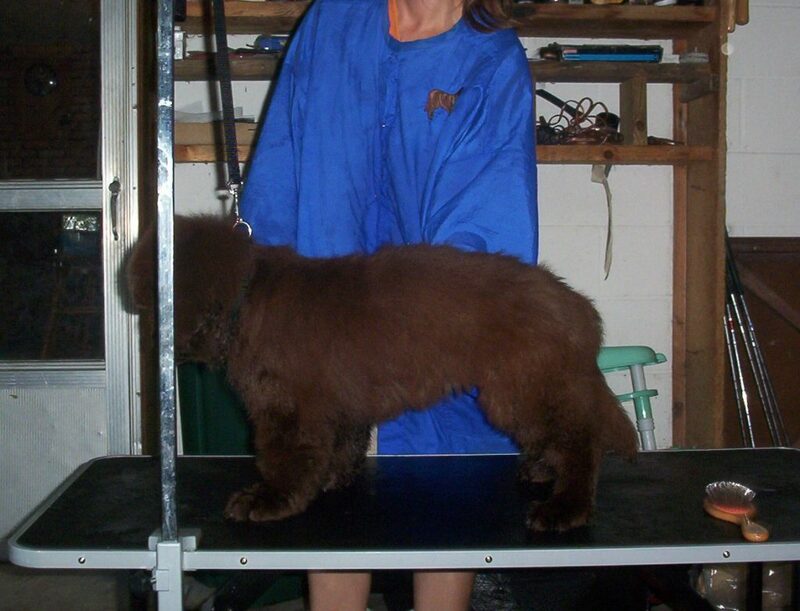 This is such a crucial time to get your Newf used to the comb, brush, rake, dog dryer, grooming table, and shears. A grooming table is one of the most important grooming supplies that you need and a puppy should be introduced to it as soon as possible. 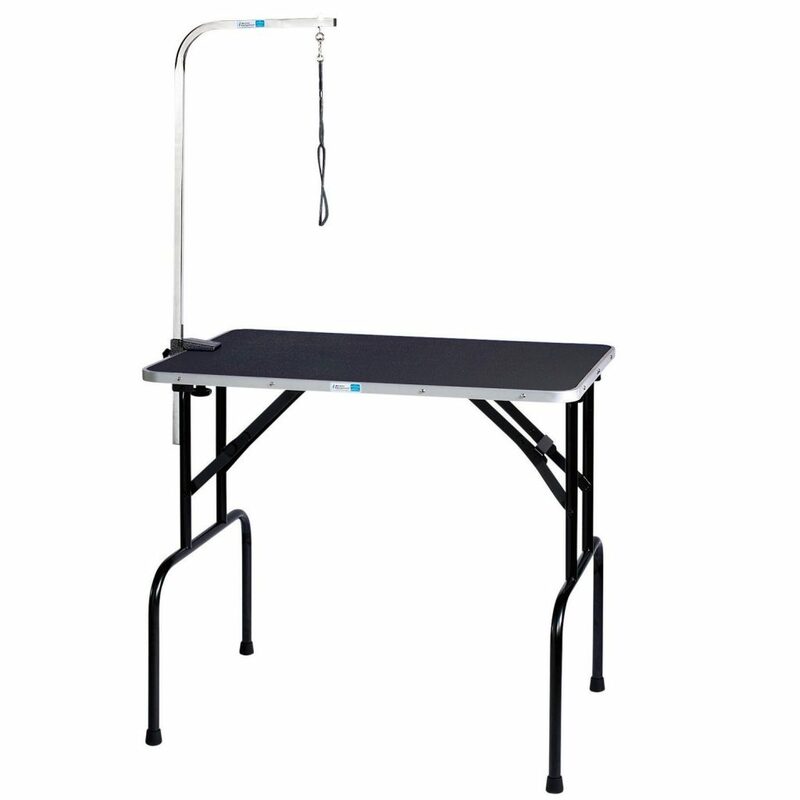 Why a grooming table? A grooming table is a designated place for grooming and the sooner your puppy realizes that the better. Grooming a puppy or grown Newfoundland on the floor can be difficult because they associate the floor with naptime or playtime. If you don’t want to invest in a grooming table then designate a grooming area. This can be a separate room or an area of a room in your house or even in the garage or back patio. You can use a yoga mat or a cooling pad as the designated area. Having the wrong grooming tools can make or break a good grooming experience. If your dog all of a sudden doesn’t like being groomed or seems uncomfortable from the beginning, check your grooming technique and your grooming tools to make sure that they are not pulling at the hair and causing your dog pain. 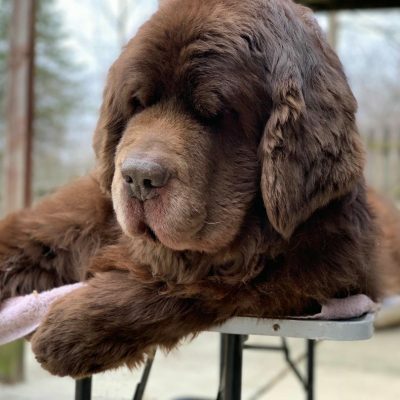 Finding a time to groom your Newfoundland can sometimes be a challenge with the hustle and bustle of daily life but keep in mind that a Newfie’s coat is not that hard to care for when a regular grooming schedule is followed. Instead of randomly grooming when you have a few spare minutes try to set up a grooming schedule. Try having a designated time and day to do a good groom. When Sherman and Leroy were younger we used to put them up on the grooming table every Friday night in the garage. Sometimes it would include a bath but it always included a dry blow out, a brush and comb of all sides and furnishings and trimming if needed. I always looked forward to this time because it was therapeutic for me and I got to spend quality time with my boys. Since you’ll be spending a lot of time grooming your Newfoundland you want to make sure that they see this time as a good thing. Start off slow and increase the amount of time you spend on grooming. Don’t expect a puppy to sit for an hour for grooming. Start off at a few minutes and work up. Make sure you are offering high-value treats and praise for each successful grooming session. Don’t wait to groom your Newfoundland when you notice mats starting to form. Trimming out mats can sometimes be uncomfortable and you don’t want your Newf’s first grooming experience to be a negative one. 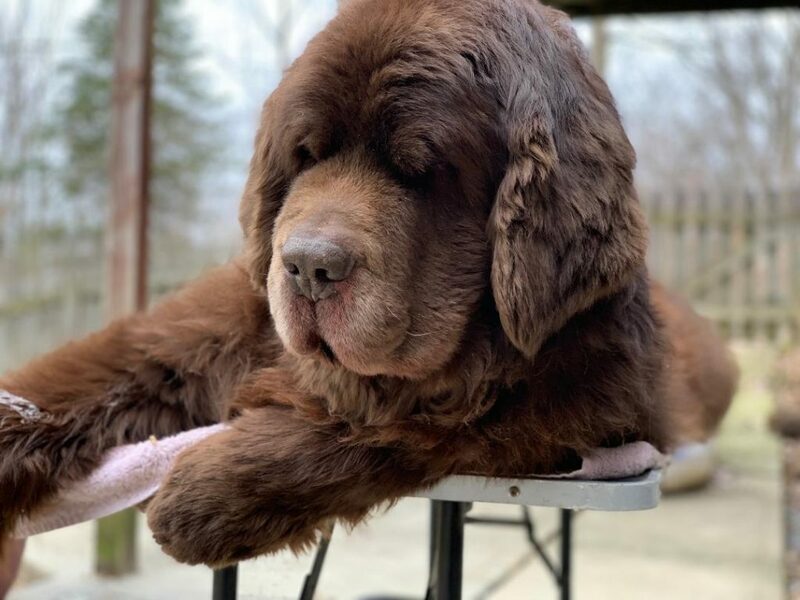 Even if you plan on having a dog groomer take care of your Newfie’s major grooming needs, they still need to be comfortable with grooming time. Prepare your Newfie for their first trip to the spa by doing basic grooming at home. This will make their trip to the dog groomer a much more enjoyable experience. 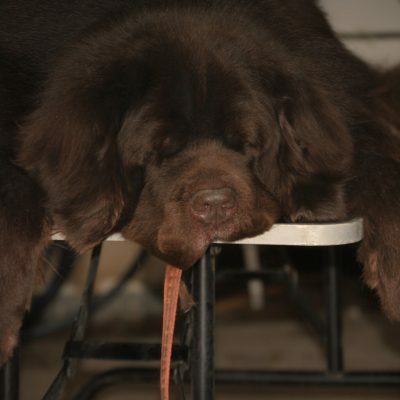 When done early on, grooming your Newfoundland should be a great bonding experience for the both of you instead of a struggle and negative experience. 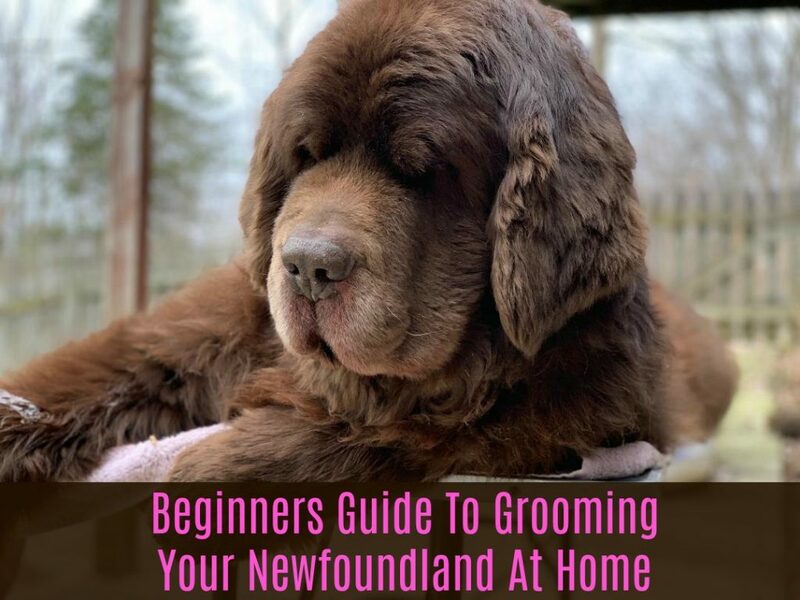 Interested in learning more about grooming your Newfoundland? This year will be breaking down basic grooming step by step. Perfect timing! We just got a newfie puppy and were worried about this. We don’t have room for and don’t plan on getting a grooming table so I appreciate that you gave some other ideas on how to make it a designated space/event. Time to get started! Thank you! You’re welcome and congratulations on your new puppy! How fun! We’re going to be doing a lot of talking about grooming in the next couple of months so make sure to stay tuned and sign up for our newsletter which will have some great tips! That is so true. When I had my first Newfie I knew nothing about grooming! I lived and learned and I’m still learning! I hear you about pulling muscles. I have a shoulder that is throbbing almost every day from helping these guys when they aren’t feeling so great! I hope you heal quickly! Well done! Despite doing a full groom including bath once a month for pet therapy visits, sometimes Sam acts like it’s day one. Knuckleheaded dog! Since the day I brought Elsa home I took a brush to her to get her used to it. She doesn’t like it one bit and can only handle a few minutes at a time before getting too stressed, but she’s getting better. Treats are a godsend. Hahaha. Sam sounds like Leroy. I gave him a bath the other day and he was so disgusted with me!